This low carb Cauliflower Rice Pilaf has endless potential. It’s a low carb, gluten-free, grain-free, keto side that goes with almost any main protein. We have had such a tremendous week – both on the blog and at home. The sun has been shining, the mornings and evenings have been pleasantly cool and the afternoons warm. This is the kind of weather that makes me happy – happy. I love walking my circuit around the back yard, looking at all of the plants, wondering which roses are going to bloom next and which plants I will have to replace after our long hot dry Summer. I love examining the flowers, searching out the life that is teaming on, among and around them. There have been quite a few aphid parties on the new shoots and buds of my roses, but they are easily dispatched – nothing a few minutes of morning finger-squashing can’t handle. I’ve also found lots of green garden spiders and baby praying mantis, butterfly eggs and caterpillars, but interestingly no lady bugs yet. Speaking of time going fast, do any of you remember when Rice Pilaf was all the rage? I do. Am I dating myself? 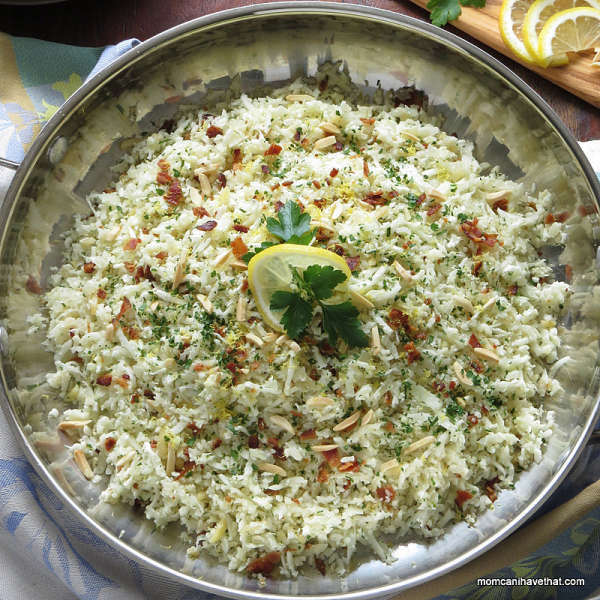 Rice Pilaf is long grained rice that is sauteed in butter and then cooked in a broth – usually chicken broth. It is commonly started on the stove, then placed in the oven to cook. It can be prepared many ways. When I made rice pilaf, I always sauteed onions and garlic to flavor the oil before adding the rice. Sometimes, I would add vegetables to my pilaf like peas and carrots, other times I’d add wild rice, orzo, fruit, nuts, or even flavor the chicken broth with saffron, resulting in a more elegant pilaf. Each variation was great and we never got tired because it was always different – and always good. This cauliflower rice pilaf is just as tasty as my old standard and is a terrific side that goes well with almost any protein. It’s almost as versatile as the original recipe, but much lower in carbs. 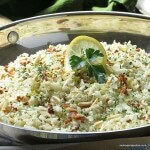 Riced cauliflower pilaf starts out very similar to traditional rice pilaf. 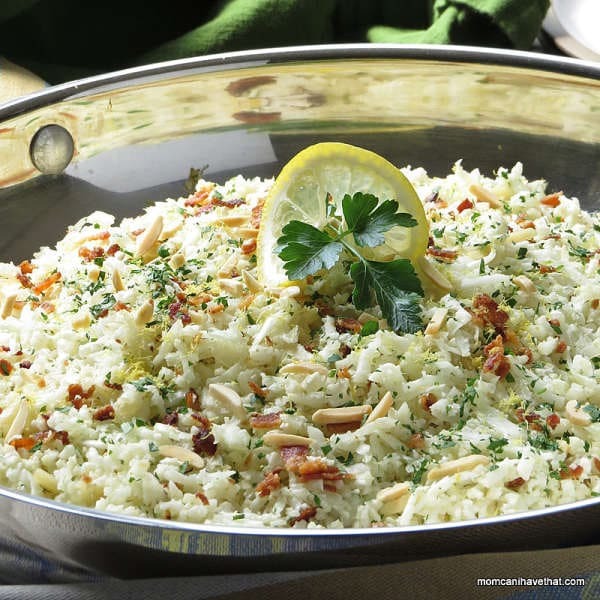 It starts with flavoring butter or oil with onions and garlic, then the raw, riced cauliflower is sautéed until tender, crumbled bacon is stirred in and chopped parsley sprinkled on top. Not only is this recipe tasty, but it satisfies many special diets including those that are gluten and grain-free, Paleo, low carb and dairy-free. This terrific side that goes with any of your fancier entrees or it’s great on its own as a one dish meal. I enjoyed it mixed with a little chopped chicken the other day and it made a great lunch. It’s also great as a “rice bowl”! I can see endless possibilities with this dish and I encourage anyone to make this cauliflower rice pilaf their own by cooking to their own tastes. Consider serving this alongside an elegant entree like Chicken Thighs with Mushrooms & Tarragon Cream, Pork Loin Piccata or even Turkey Marsalla. Garlicky Oil & Vinegar Green Beans is another terrific side to accompany any meal. Thinking of dessert? Nana’s Cheese Pie, a simple no-crust cheesecake, is a very popular post! Cauliflower Rice Pilaf is 4 net carbs per serving. This Low Carb Cauliflower Rice Pilaf is easy to prepare, free of many food allergens, and great for special diets - a versatile side that has endless possibilities. Cut the cauliflower into small chunks and grate them in a food processor or by hand. In a large skillet, cook bacon until crispy and remove from the pan, leaving the fat in the pan. While waiting on the bacon, finely chop the onion and mince the garlic. Add the almonds and onion to the pan and saute until the onion is almost translucent. Add the garlic and cook with the onions and almonds for 1 minute. Add the cauliflower and cook until softened. Remove from heat. Stir the salt and pepper into the cauliflower pilaf and taste. Adjust seasoning. Crumble the bacon and stir into the cauliflower. Add the chopped parsley and stir or leave on top as a garnish. Zest a lemon over the top and serve. The bacon? As she can not get any process meats. Thank you! Did you miss adding the oil to the ingredients? You mention it in the description. I had your pilaf tonight with a creamy shrimp, mushroom, and bacon skillet recipe. Since my husband and I love bacon, we were in seventh heaven. 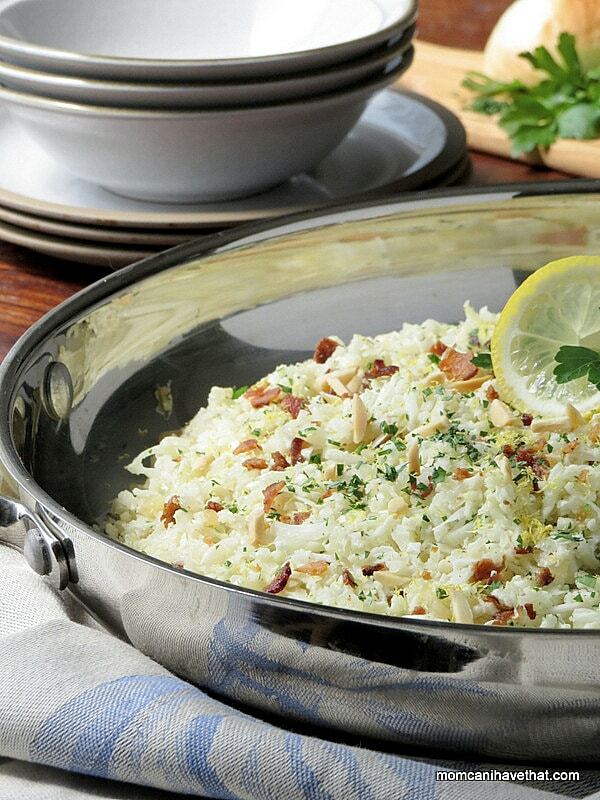 I’ve tried many, many different cauli-rice pilaf recipes and yours was by far the best. I really appreciated your giving the amount of onion in ounces, rather than just saying “1/2 of a small onion,” because I’m never sure what constitutes “small” to others. I have one suggestion (that I learned from the cookbook, Paleo Perfected) for getting the “rice” the perfect size. Process the cauliflower in two batches in a food processor by pulsing each batch 6-8 times. (I pulse 8 times.) The “kernels” are just the right size. Thanks again for another outstanding recipe. Any way you could tell me how many cups this makes, trying to figure out how much a serving is. It says 10 servings, but not the amount of each serving! Yum! Looks so healthy and satisfying! I love cauliflower…pinning this! Hi Veronica! Thanks, it’s a great side. Hope you like it.